How To Best Achieve Visual Scheduling in Dynamics NAV? Graphic planning boards provide proven and valuable support where scheduling, planning and controlling of orders, tasks, and resources are concerned. 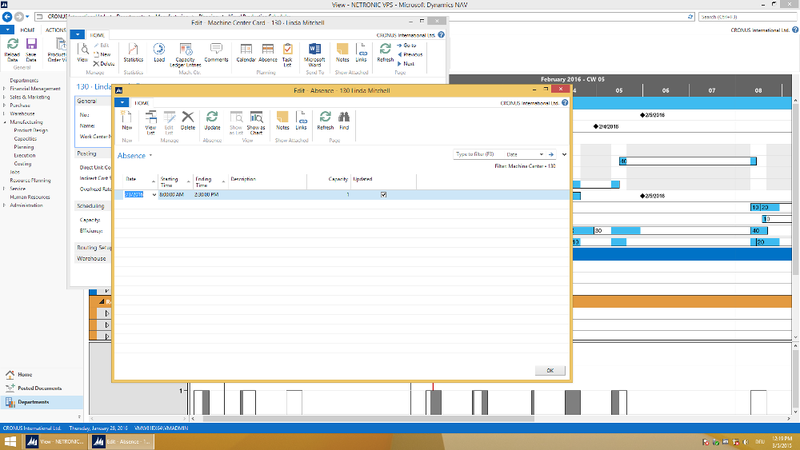 However, the current versions of Microsoft’s ERP system Dynamics NAV don’t offer any visual scheduling. Hence, customers dealing with manufacturing orders, project data, resource and capacity planning challenges as well as service order dispatching need to find a way to close this functional gap. In doing so, they need to make many choices - with respect to usability, functionality, total cost of ownership and the respective technological approach. From this blog post, users looking for a visual scheduling solution for Microsoft Dynamics NAV can learn three characteristics why we recommend going the add-in route. Why do users need visual scheduling capabilities in NAV? Before answering main question how to best achieve visual scheduling in Dynamics NAV, I want to quickly recap why users need visual scheduling capabilities. These capabilities are always related to time-oriented and resource-centric planning data which have dependencies. By visualizing these data (using data from multiple NAV tables) in an intuitive manner, users better understand the schedule, the constraints, the issues and the dependencies. They yield an information value. This information turns into a decision value as the visual scheduler helps the user focusing on the decision-relevant information thus enabling immediate corrective actions. The faster these corrective actions are triggered, the better the improvement of the operational agility will be. So ultimately, the decision value turns into a business value. Data used for visual scheduling must combine relevant information from various NAV tables. Data must get filtered, aggregated, and be represented in an intuitive manner. The data presented should be context-sensitive and come with a kind of “auto focus” on the decision-relevant information – based on the user’s current decision need. Operational agility only can get achieved if the user can change the data – hence the communication with the user and the data must be bidirectional; data must be interactive. An add-on is less secure. Add-ons typically work with their own database and hence send data to third-party systems, which can leave your system completely vulnerable. Add-ins in turn remain entirely within Microsoft Dynamics NAV and hence the often critical and sensitive data do not leave your environment. Add-ons require more training. Typically, add-ons come with their own branding, user interface, and menu structure. As such, they provide a completely different user experience compared to Dynamics NAV. Training a user to work with an add-on is very similar to training them to apply an entirely different software system altogether. Add-ins, by contrast, work directly within the system and enable users to fully stay in the environment in which they have been trained anyway. Add-ins seamlessly integrate. An add-in is basically increased functionality within a system while an add-on is something that is patched over the system. Patching something over a system can create system incompatibilities, confusion and general disarray. A properly built add-in is an enhancement that many would be unable to tell did not come with the original software system. It feels like a natural puzzle piece of the entire Dynamics NAV system. Add-ins offer quick deployment. Typically, an add-in allows for a fast and easy deployment, and the installation may take only a few clicks. It requires no adjustments of the standard NAV, which makes it a rapid-fire solution that can be up and running for the benefit of the users in a matter of an hour. The scalability advantage of an add-in. Add-ins integrate into Dynamics NAV and hence do not require any kind of "overhead code" such as menu bars, backend databases, integration and synchronization. They typically come with much leaner code. Hence, add-ins can get enhanced and can grow in a much more agile way. 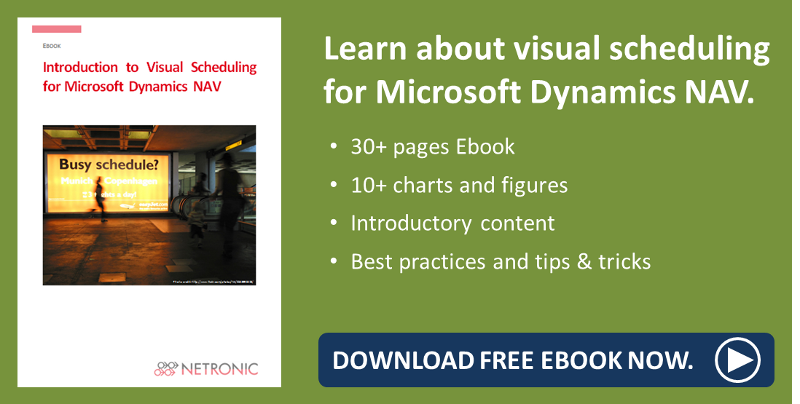 All of the above let us come to the conclusion, that we recommend implementing visual scheduling within Microsoft Dynamics NAV as an add-in product. The phrase “product” – rather than “solution” – leads to another question that has to be answered when deciding how to best achieve visual scheduling within Dynamics NAV: The question of product vs. solution, resp. high degree of standard vs. high degree of customization. This issue relates to whether you want to accept the NAV standard as is, and provide additional functionality to all NAV users – or if you will enforce the user to significantly move away from the standard by providing a much customized solution. Answering this question has two dimensions: (a) the first dimension is related to the general purpose of visual scheduling and the second dimension (b) is related to the specific business processes which are subject to visual scheduling. (a) The essential purpose of visual scheduling is to provide the users with an intuitive picture of their schedule so that they can see scheduling issues at one glance, and can take corrective actions immediately. The key phrases here are “intuitive” and “users”. In this context we are talking about a precisely defined group of users: the users of Microsoft Dynamics NAV. They all have in common that they very well know one specific ERP system (Dynamics NAV), for which they typically have received a lot of training, so that they are familiar with the NAV data, data structures and the meaning of the respective data. It should be no surprise that a solution based on the standard the users are used to, is more intuitive to them than a solution for which they would have to learn new data fields, new data semantics, a new data model, etc. The less the visual scheduling add-in requires changes to the Dynamics NAV standard, the more intuitive it is for the users. (b) As I outlined before, the best way of providing a visual schedule is to deliver the schedule’s data by using the Gantt chart technique. A Gantt chart is a common technique which is not tied to a specific use case: Its base elements (time scale, resource table and graphical part) can be applied to multiple scenarios ranging from production scheduling over project management and service staff scheduling to fleet and logistics planning. So the question arises if visual scheduling for Dynamics NAV should get achieved by a “one size fits is all” approach or if it should have some kind of “industry flavor”. Again – applying a strong focus on the requirement that visual scheduling should always be intuitive seems to be the key to answering this question. Although the visualization technique (Gantt chart) is the same across multiple functional areas, the underlying business processes, planning & scheduling workflows and decision criteria needs differentiation. A production planer has a different job description and different job goals compared to a service staff dispatcher, who in turn deals with very different questions than a project manager. The specific needs of these different personas are reflected also in the specific Dynamics NAV modules, which are designed to best support the various tasks of people working in different functional areas. Consequently, a production planer user is used to the production and capacity data model and data. Likewise, a service dispatcher is used to service orders, service item lines, resource allocations etc. To them, a visualization technique is much more meaningful if it (a) directly relates to the specific data they use to work with on a daily base and if it (b) is tailored towards their specific scheduling and planning needs. Although a Gantt chart is a common visualization technique, it is recommended that the visual scheduling solution is focused on one specific functional planning and scheduling need. We do not believe in a one-size-fits-it-all approach. There are dedicated modules for production, jobs and services in Dynamics NAV - with their own workflows and business logic. Consistently built Gantt scheduling add-ins shoud support these processes ... and neither create new processes nor try to unify them. So, how to best achieve visual scheduling in NAV? and at the same time has a functional focus in terms of the NAV module(s) it is based on. These preliminary thoughts concerning an intuitive, flexible and solidly integrated visualization product for NAV are part of our introductory Ebook about the value of visual scheduling in NAV. Download a free copy here.